Visibility is a key concern for bikers looking to stay safe on busy urban streets, particularly at night. Photo by Bridget Coila/Flickr. 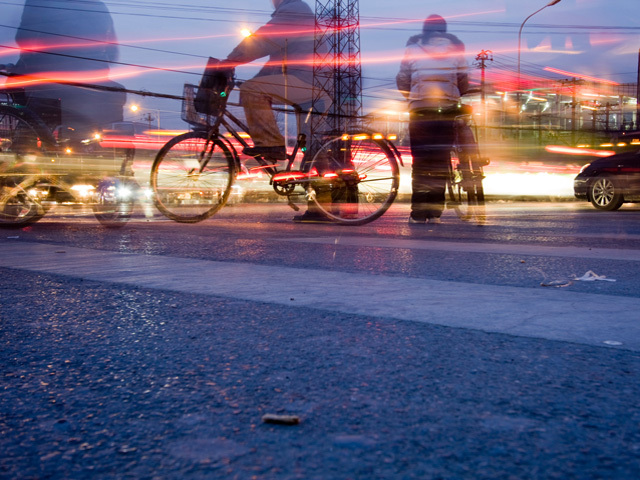 It’s no secret that visibility is critical to bike safety, especially under dark nighttime skies. 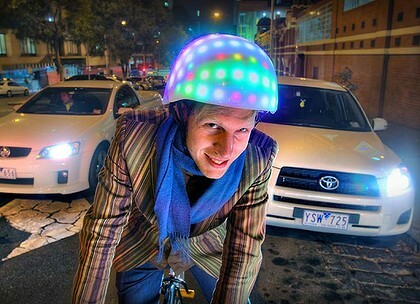 To help ensure that cyclists can be easily spotted by motorists in crowded streets, Wouter Walmink, Alan Chatham and Floyd Mueller of RMIT University in Melbourne, Australia created a contraption that can only be described as part disco ball, part bike helmet. This new interactive helmet from Exertion Games Lab combines whimsy and fun, making bikers more visible and safe on city streets. Photo via Exertion Games Lab. The lights are controlled by an”accelerometer”, a motion sensor that warns drivers and pedestrians which direction the rider will take. Moreover, the LumaHelm has a mechanism to read the heart rate of the rider and modify the frequency with which lights shine. Check out the video below to see the LumaHelm in action.